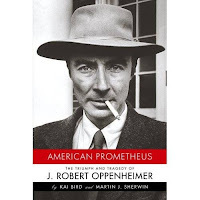 I recently read American Prometheus, the Triumph and Tragedy of J. Robert Oppenheimer. It won a Pulitzer, so there's that. Moreover, it is exhaustively researched, often spending substantial effort to unravel ancient questions, or at least to indicate the problematic nature of historical investigations. Often, even the principals involved do not agree on what actually took place, a phenomenon we're all familiar with. The book is huge, and I'm going to focus on only a tiny sliver of it, but one that has some relevance to current questions and some recent commentary on this here blog. The history of the creation and evolution of the Cold War is complex, and many people have various "woulda, coulda, shouldas" in their heads about the entire matter, just as many people believe that the use of nuclear weapons on Hiroshima and Nagasaki was a contingent decision that could have been made in other ways. My own sense of it all has long been that these things were as close to inevitable as anything in human history. Given that nuclear weapons had been created, their use in an ongoing war was a forgone conclusion. There are details that could have been different (and I am hugely grateful that Kyoto was not a target), but the events were inevitable. There is also some discussion in AP about the theory that the Japanese attacks were really meant as a threat to the Soviet Union, the opening salvo in the Cold War. Certainly there were those who argued for them on that basis, but there are always many players in the game, and I see no reason to believe that this reasoning was decisive. Truman also worked to get the Soviets to enter the war against Japan; it always looked to me like he was simply using everything in his arsenal to end the war. But after the war, events developed a momentum of their own. The Strategic Air Command, part of the newly formed Air Force and under the direction of Curtis "Strategic Bombing will make Battlefields obsolete" LeMay, worked hard for a nuclear monopoly. It failed because the other services wanted them some nuke macho too. Then there are the scientists. Let's look at Oppenheimer, Teller, and John von Neumann. Teller is well-known as the "Father of the Hydrogen Bomb," originally just called The Super. His testimony in Oppenheimer's security clearance hearing resulted in his, Teller's ostracism by many in the scientific community for years afterwards. On the other hand, he had a national lab built for him (Livermore). Teller's motivations for working on the Super are not as clear cut as one might think. I suspect he just thought it a very cool gadget and rationalized the rest. However, he was Hungarian, and not the most friendly guy towards the Russians, and said so, many times. He wanted the U.S. to have the Super before the Russians got it. And I will give Teller this due: his bombs have never been used in warfare, at least so far. Von Neumann, another Hungarian, was even more bellicose than Teller. He advocated pre-emptive nuclear strikes on the Soviet Union in order to forestall their ever achieving nuclear weapons. This would also have had the effect of toppling the Soviet government and requiring a U.S. occupation of Russia, which he was also fine with. Von Neumann was also on the Japan nuclear targeting committee and was one of those pushing for nuking Kyoto, a city of practically no military significance. Finally, there is Oppenheimer, who opposed the Super, and paid dearly for it, eventually losing his connections to the halls of power. But lest we get all teary-eyed, realize that he acceded to the Japanese strikes, albeit with some later breast beating. Moreover, and this is the interesting part, Oppenheimer argued that, rather than building bigger weapons, such as the Super, which he thought was purely genocidal, the country's stockpile of fissile material should be used to build smaller, tactical, battlefield nuclear weapons. Subsequent thinking has been that such weapons blur the line between conventional and nuclear weapons, making escalation to full-scale nuclear war easier. Truly large bombs, the multi-megaton behemoths have largely faded from the scene. Current nuclear arsenals contain mostly sub-megaton weapons, albeit small and MIRVed, and still several multiples of the Hiroshima sized yield. Part of that is the first part of Oppenheimer's logic: there just aren't many uses for huge bombs. Even genocide has its limits. What I take away from the exercise is this: Oppenheimer, Teller, von Neumann, these were three of the smartest guys on the planet, each committed to "rationality" in his own mind. But each one of them managed to argue himself into a position that seems simply crazy on the face of it, unless nuclear genocide is sane, and those of us who find it horrible are somehow the ones who have lost our minds. At least a part of the social process that leads these minds through that particular looking glass is the personal bloodlessness of their product. Delivered remotely by the help, the very real thermonuclear energy release harvests a fairly abstract death yield, a statistical aggregate of strangers — a bunch of people we didn't know are no more. Compare with the Rwandan Hutu that delivered mass death from arm's length with a macheté. Gets crazy fast, discussing the sanity of bloodlust. I've always had reservations about the Air Force guys, for the "remote from the killing" reasons you cite. But, as you note, mass deaths can and have been up close and personal, so we naked apes don't get off so easily as to simply say that off-stage deaths don't count. Anyway, for obvious reasons something that I have thought of from time-to-time these past 7 years.